Stationmaster: I'll be darned if I understand you city folks. Always rushing, rushing, rushing. Always thinking about the future. No wonder you have stomach trouble. This has got to be one of the most delight comedies ever made. I totally agree with one comment that says "Around the World in 80 Days like a fine wine, it gets better with age". 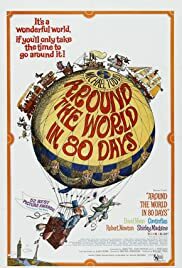 Featuring fine performances from David Nivven, Cantinflas, and the rest of the cast in this wonderful movie about a man and his servant who try and travel around the world in just eighty days. This movie oddly enough was 175 minutes long and in all honestly I didn't believe that for second when I first heard because it really only seemed like 88 minutes. One of the most fun, wittiest, and delightful films of all time and that's coming from a person who adores film and has seen plenty in his (my) day. I do not recall the last time I had so much fun while watching a movie, it's basically just one big fun fest! The cinematography and photography are unarguably some of the best ever in any film. How anyone could call this film boring is beyond me. It is fun, witty, delightfully written, directed, and as I already mentioned acted. The score is also a work of genius. See this film, then see it again. If you hate it, well, then you need to lighten up a bit (no offense intended).